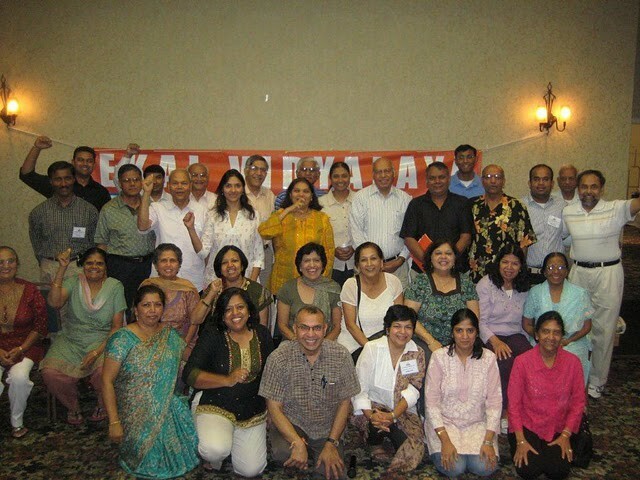 EVF USA celebrated their 10th year at the Dallas Convention held from 17th Sept. to 19th Sept. 2010. Around 100 delegates from USA chapters and EVFI graced the convention. It started with the welcoming of the delegates. The volunteers discussed about the expansion of the chapters in USA. Right know there are 35 chapters and next year they plan to add 5 more. This year the event committee of EVFUSA did a remarkable job and had ekal presence felt all over USA. The youth team is bringing in new ideas of how to popularize ekal, handling the website etc. 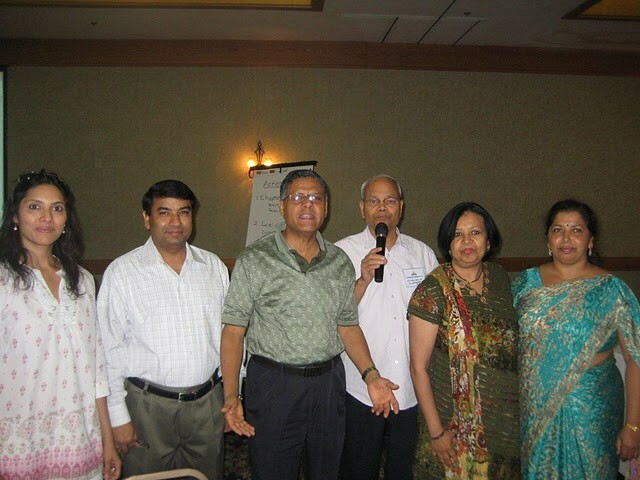 The Dallas team was a good host, headed by Smt Kalpana and Sri Kishore Fruitwala. On Friday evening they had a cultural programme inviting all the donors of Dallas. EVFI requested all EVFUSA volunteers to visit ekal schools and have a first hand glimpse of how ekal is transforming the villages. 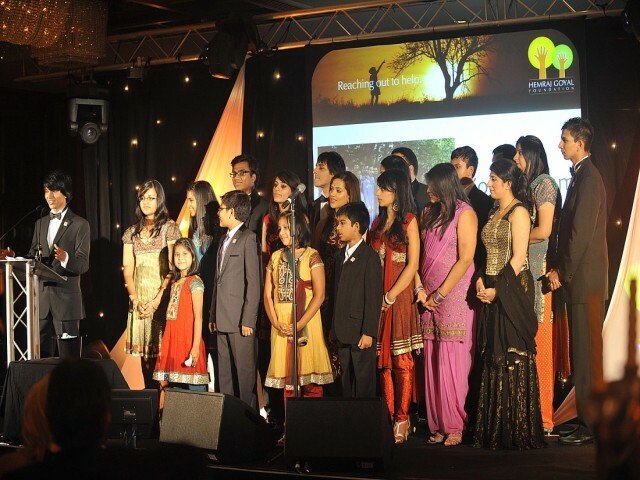 EKAL VIDYALAYA FOUNDATION opened its UK support group under The Hemraj Goyal Foundation. The launch ball was held on Saturday 11th September 2010 at the Radisson Edwardian Hotel, Heathrow, London and it was an amazing success. Funding for more than 250 schools was collected - potentially touching the lives of 10,000 children just from one night’s fundraising! Representatives from Ekal Vidyalaya Foundation of India were Sri K.N. Memani, Chairman, Smt. Kiran Memani, Sri Pradeep Goyal, Trustee, Smt. Neeru Goyal and Smt. Sangita Gupta, Global Co-ordinator, who flew in from India the night before to attend the event and talked about the charity’s work. The master of ceremonies Sri Hardeep Singh Kohli ensured that the night was full of life and special guests Miss England, Miss Wales and Miss Universe GB added to the glamour. The Hemraj Goyal Foundation’s youth team spoke with dignity and simplicity about how they wish to make an impact helping others, and 7-year-old Alisha brought a tear to everyone's eye. Sri Avnish Goyal, Sri Vidya Goyal and Sri Ram Goyal, nephew of Sri Brahm Ratna Aggarwal of USA had visited Ekal School earlier this year with their family members. They were moved by the project taken by Ekal Vidyalaya. They launched their Foundation with Ekal Vidyalaya as their Prime Project. Friends of Tribal Society, Bangalore in association with Vittala Eye Hospital- Bangalore, Shiv Sakthi Trust and Seva Clinic Bangalore arranged two Health check up and eye screening camps at Indiranagar Village of Bellary Anchal on 28th August and Madnala Village of Gangavathi Anchal on 29th August, covering about 15 to 20 surrounding villages. 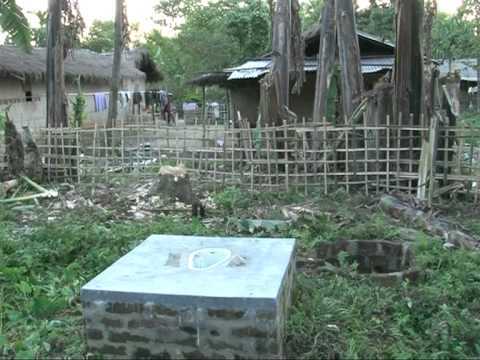 These villages are associated with Ekal Movement. These camps were conducted by Arogya Foundation of India (Bangalore) from financial assistance provided by Shiv Shakthi Trust Bangalore. The Medical camp team comprised of Dr. Sushma, Ms. Uma, Sri Guruswamy & Sri Ranganath of Vittala Eye Hospital Bangalore and Dr. Sathish of Seva clinic Bangalore. From the Chapter Sri Sudhir Shetty & Sri B.S Srinvas attended the camp. 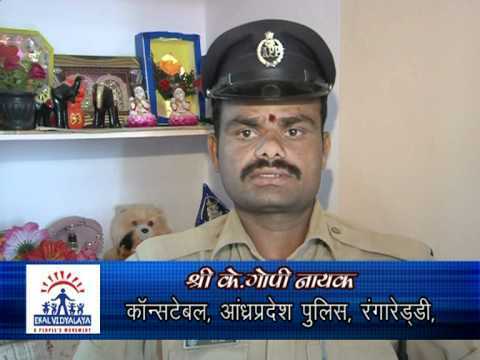 Indiranagar is in Koppal District and comes under Gangavthi Anchal. The villages covered were Indiranagar, Dhanagana Doddi, Andrapur, Mangaloor, Hosur, Bellebhavi, Abbigere, Jabbalgudda, Boodhgumpa, Amrapur and Kenchanadoni. They are all remote villages. In all 363 people attended the camp. Camp was inaugurated by Gram the Panchayat President by lighting the lamps in the presence of Samiti members Sri Lingappa and Sri Durgadas Bhanadarkar. Sankul Samiti members and Dr. Raju, a Social Worker (popularly known as Dr. Andhral) also attended the camp. Just before inauguration, the tribals from Thanda gave a dance performance. Sri Duradas Bhandrkar, Sri Lingappa Samiti members and 10 full time workers from the Anchal whole heartedly involved in conducting the camp successfully. On 29th August free Medical Camp was held at Madnala village Kustagi Tq.. The inauguration of the camp was done by Sri Sri Bangar Setty, Samiti member Kustagi Sankul. In this camp 316 people from Madhnall, Bogur, Muganoor, Sebinakatte, Madikeri, Yeragagere, Donnegudda & Hirebangoll attended the camp. The function has received Press coverage in Prajavani, Samyuktha Karnataka, and Kannada Prabha Kannada daily. Local villagers arranged lunch for those children’s who attended the camp. 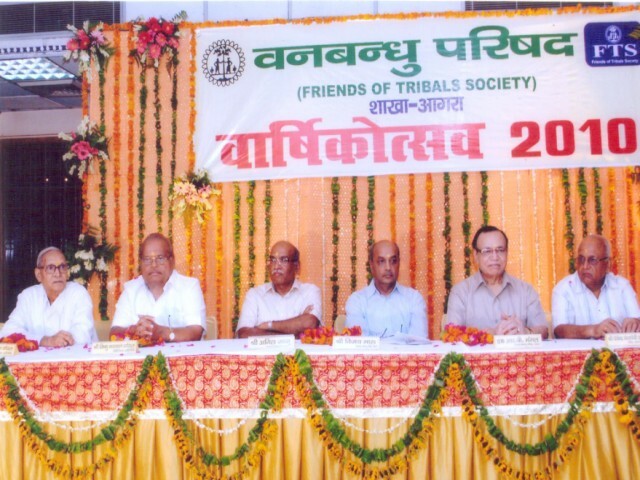 Friends of Tribals Society Agra celebrated its annual function at Agravan Conference Hall on 22nd August, 2010. The Function was inaugurated by Sri Vijay Maroo, President, EVFI with garlanding of pictures of Saraswati Ma, Swami Vivekananda and late Rakesh Agrawal, and lightening of lamp. Sri Vishnu Bhagwan Goyal, Sri Gopal Gupta, Satya Narain Goel and Central Observer Sri Anil Jaju, Chairman, North Zone, FTS also graced the occasion. On the occasion Dr. R.P. Mangal welcomed everybody, and speaking over the national importance of FTS, said, As the significance of forest in life can not be denied, exactly similar is to get rid of naxalism to nation by educating the tribals. Chief Guest Sri Vijay Maroo gave details of progress of Ekal Schools, and requested the citizens of Agra to make maximum donations. Repeating the objective of 1 lakh schools by 2013 he asked for their cooperation. Sri Anil Jaju informed that tree plantation expedition is going on in every Anchal. Vanvasi Samajothan Darpan magazine was released by the chief guest. The Zonal Mahila Nagar Sangathan Varg was successfully held in Lucknow on 4th and 5th Sept., 2010. Women volunteers from North zone comprising of Uttar Pradesh, Uttarakhand Punjab, Hariyana, Rajasthan, Himachal took active part in the Varg. Smt. Kumkum Ray Chowdhary, Director, Sahara India Group, inaugurated the Varg by lightening the lamp. 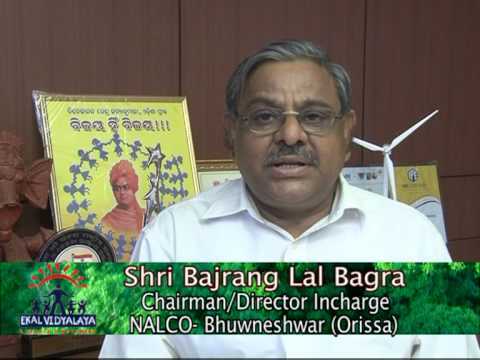 Sri Naresh Jain, National President, BLSP, Sri Indra Mohan Aggarwa, Gen. Sec., BLSP, Vinod Aggarwal, Org. Sec., BLSP also graced the occasion. The varg started with the inaugural ceremony by chanting Omkar, Gayathri Manthra and Saraswati Vandana. Around 150 people attended the varg. 70% out of total presence were from Anchal and Sankul level. The varg was very exciting. Some very good cultural programmes were performed by our ladies volunteers of Lucknow. It was resolved that Swavlamban Sangrah should be done on the lower levels and expansion of Mahila Samiti on all centers. All emphasized to ensure the quality of work by communicating and traveling in all areas. It means presenting in Sanch Abhyas Varg to improve the quality of school by talking with the teachers. 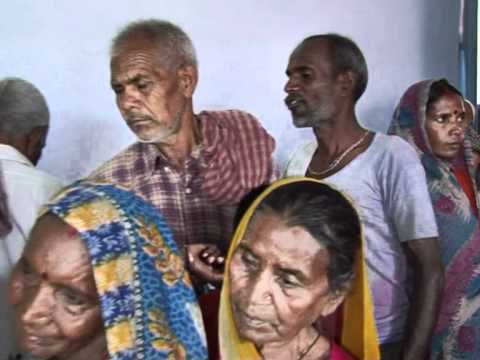 Health camps would be organized on the Sanch level with the help of ladies Acharyas. It was decided that every Acharya and fulltime volunteers will be honored by presenting gift on the occasion of Makar Sankranti. All participated actively in the varg. Smt. Meena Aggrawal, Principal, Central School Delhi, was the main speaker of the varg. The varg was a great success. 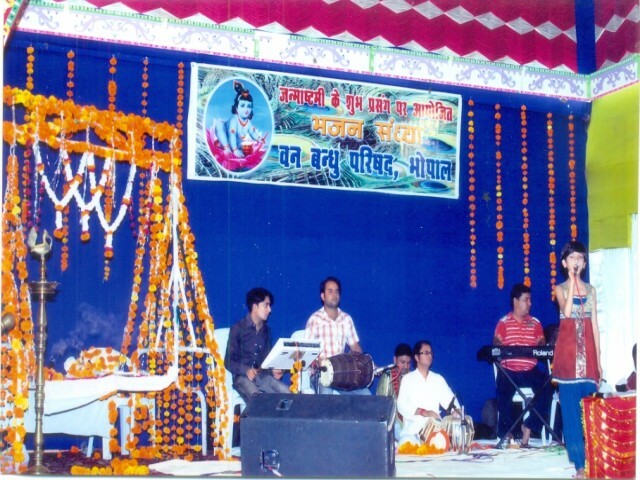 Mahila Samiti of Friends of Tribals Society, Bhopal organized a Bhajan Sandhya on 31st August, 2010 on the eve of Sri Krishna Janamashtami. The programme was presented by Tulsi Manas Sansthan. It had reciting of holy songs, cultural programmes and Jhanki of Ekal Vidyalaya. On this occasion, 300 delgates alongwith their families were present, which included Hon’ble Shashi Bhai Seth, Sri Purshotam Sodhani, Evaluation Incharge, Ekal Vidyalaya Abhiyan, Central Zone, and members of Bhopal Chapter. Shri Suresh Kumar Chokse, President, Sri Ajay Kumar, Vice-President, Sri Deepak Baheti, Treasurer and other officials of FTS Bhopal welcomed all the guests. Chief guest Sri Shashi Bhai Seth and other dignitaries inaugurated the function by putting on the garland to the statue of Lord Krishna and to light the lamp. The function ended with holy songs by Sri Ravi Khare. Audience were also enchanted with songs by a little girl. In the programme, Sri Ravi Khare asked the questions to the audience about Lord Khishna. Krishna’s miniatures were given to the ones who gave correct answers to his questions. Sri Suresh Kumar Chokse, President, FTS Bhopal, gave a vote of thanks. Everyone present appreciated the programme very much.